Take in the fresh mountain air while enjoying a soak. There are 10 tubs scattered throughout the property. Can't decide if you love indoor or outdoor pools more? Now you don't have to. Stash your skis, boards and boots in convenient private lockers - every suite has their own. Kick back and thaw out in the genuine redwood sauna. Follow up with a bubble bath back at the condo for maximum relaxation. Every spacious suite has an inviting living area (and cozy couches) perfect for hanging out with your crew. Hop the scheduled shuttles for a quick ride to the ski lifts, or call up the friendly drivers for an excursion into town. Catch a ride to Gondola Lift, a 2 minute drive from the resort. The numerous hot tubs, heated pools and gorgeous views of the mountains make Trappeur's Crossing a perfect spot for a weekend getaway. There are 4 outdoor heated pools at the resort – try them all and pick your favorite. Unwind with a body treatment, facial or massage at the resort's day spa. The resort has 10 outdoor hot tubs, perfect for relaxing after a long day on the slopes. Take your mini-explorers out on the Emerald Mountain Trail, 12 minute drive from the resort or Spring Creek Trail, a 9 minute drive. Warm up before hitting the Rollingstone Golf Course, less than a 5 minute drive away. Just two blocks from the lifts and comprised of six luxe lodges, Trappeur’s Crossing Resort & Spa is a prime property for family ski trips. Friendly touches like après cocoa and fresh baked cookies in the lobby each evening and a complimentary shuttle service that’ll take you anywhere you like are just a couple of reasons Trappeur’s Crossing is a favorite for returning guests. 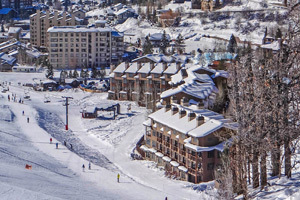 Here, you’re a short walk – and even shorter shuttle ride – away from the Steamboat Resort Gondola. Steamboat Ski Resort was named a “Premier Family Ski Resort” by Jetsetter and “The #1 Family Resort in the West” by SKI Magazine. If you’re traveling with tykes, take advantage of the Kids Ski Free Program, where kiddos age 12 and under can ride for the same number of days as their parent (or grandparent!) at no charge. The world-renowned ski school has camps and classes for all ages and levels, from Kiddie Corral lessons for toddlers to private clinics with pro skiers. To really wow your crew tell them to meet at the top of the Heavenly Daze run at 1 pm sharp. That’s where former Olympic skier Billy Kidd holds his daily free clinic! Spot him by his signature Stetson cowboy hat and join the pro for a downhill ride. Back home you’ll get to say an Olympian coached you. As dinner time draws near peruse the various eateries at the base, or head back to your condo for a hearty home cooked meal. Enjoy a lively, family-friendly après scene at Trappeur’s Crossing on Fridays – swing by the main building for drinks, finger foods and live music. Cap off the day with a soak in one of the outdoor hot tubs. Let the jets work out any ski-related kinks as you and your crew look for shooting stars. These clean and spacious one- to four-bedroom condos are awesome for families and friend groups looking for the comforts of home with the perks of a resort. Fully equipped kitchens let you whip up your favorite foods. The roomy living area with TV and cushy couches is great for game nights and movie marathons – light the fireplace to up the coziness. Individually decorated, the suites each have a little personal style but with a consistent homey, alpine vibe. Got a big crew? Book a suite with an added den or loft for extra space. If you feel like walking to dinner there’s an array of nearby restaurants at the ski village – try some casually elegant cuisine at Truffle Pig or sample the upscale menu at Café Diva. Or call up the complimentary shuttle for a trip to downtown Steamboat. Family-friendly Mazzola’s Italian Restaurants has a design-your-own-pizza option, while the Mahogany Ridge Brewery & Pub offers up gourmet dishes and a rotating beer menu. Check out uniquely-Steamboat attractions with the kids like bumper-cars-on-ice at the Howelsen Ice Rink or heated waterslides at the historic Old Town Hot Springs. - Front desk is open 24 hours during peak summer and winter seasons. The front desk is open 7:00 AM-5:00 PM Sunday, Monday, Tuesday, Wednesday and 7:00 AM-7:00 PM Thursday, Friday and Saturday during off season. Guests that are planning to arrive after hours can pick up keys from a lock box located in the lobby. To receive a code to a lock box guests must call a phone number which they can find by the front desk when they arrive. For more details please contact the property using information on the booking confirmation.